Platforms that are specially engineered to meet a customer's requirements. The CMS platform is a versatile thin film deposition system for advanced materials research and development. Configurable with six or more magnetron sputtering sources. Available Linear multi-pocket UHV electron beam evaporation source (multi-technique options available). Oil Sealed or dry rough pumping, cryogenic or magnetically-levitated turbo high vacuum pumping options available. Compatible with up to 8" OD substrates, custom configurations available. Substrate Heating to 1100°C, cooling, and biasing options also available. Single or multi-wafer load lock option available. Computer system control with recipe and data logging options available. The AXXIS platform incorporates radial deposition ports and a right-angled tilting substrate stage to efficiently facilitate multiple deposition techniques. Substrate stage allows precise angled resolution for applications, such as Glancing Angle Deposition. Up to 6 HV magnetron sputtering sources, multi-pocket electron beam evaporation source, up to 3 thermal evaporation sources (multi-technique options available). Wet or dry rough pumping, turbo, magnetically-levitated turbo or cryogenic pump high vacuum pumping options available. Standard configurations compatible with up to 8" OD substrates; custom configurations available, up to 550°C heating, cooling, and glow discharge options available. Basic computer system control with recipe and data logging options available. The PVD-DRUM platform combines a drum fixture with linear cathodes to provide a high throughput, high uniformity system. The vertical, cylindrical drum houses multiple wafers that are rotated through the linear cathodes deposition plume. Linear cathodes provide a very uniform coating over a large area to provide a typical deposition uniformity of better than +/-5%. These system utilize the standard PVD 75, PVD 200 and PVD 500 platform chambers and components. KJLC's newest array of deposition system platforms, designed specifically for use with Isoflux hollow cathode magnetron sputtering sources. Typically used in both R&D and production applications. Purpose-built for hollow cathode sputtering sources, yet based on existing, proven KJLC system platforms. Wet or dry rough pumping, diffusion or turbo pump high vacuum pumping options available. Simple PLC-based touch screen system control and full computer controlled automation available. System tools utilizing the innovative Pulsed Filtered Cathodic Arc Source technology. Highly efficient for hard coatings and diamond like carbon coatings. Arc systems allow a high level of film property control, such as tuning the films compressive stress. 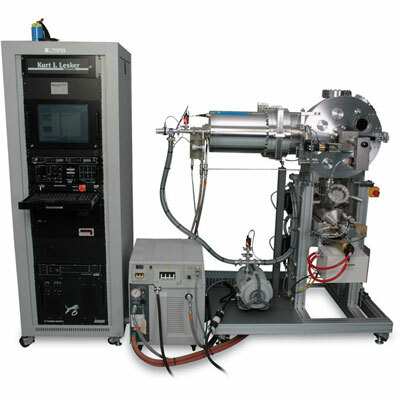 Arc systems operate at a lower pressure than traditional sputtering tools.